Can James Bond Push The Jaguar C-X75 Into Production? If you ask Jaguar, they say the C-X75 is still a no go. If you ask the people who actually designed and built the car, they say if anybody, Agent 007 just might be able to push it into production. Take your bets! 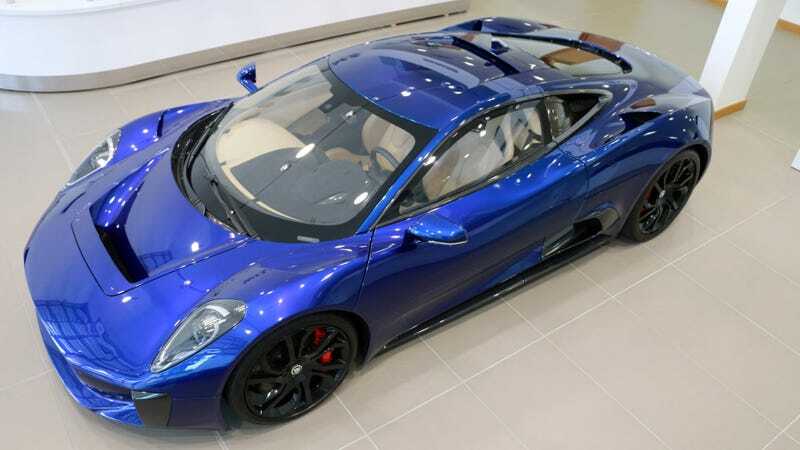 The Jaguar C-X75 started out as a jet-powered electric hybrid concept in 2010 and became a fully drivable twin-charged hybrid prototype with almost a 1,000 horsepower by 2011, but Jaguar decided not to put into production the following year due to the economic crisis. Jaguar fans have demanded it ever since. I sat down with Jaguar Land Rover’s Head of Design and overall great guy Ian Callum at the Concours of Elegance in Edinburgh to talk about why the original Aston Martin Vanquish couldn’t reach its full potential, and how he made sure that his kids will love classic Minis. But as always, I also asked him about the C-X75’s fate now that they put it into Spectre as the villain car James Bond sets ablaze with his Aston. Callum told me that they’re so busy with other projects that he sees no place for a limited-edition hypercar like this in Jaguar’s lineup for as long as in the next ten years or so. Two days later, I went over to Williams Advanced Engineering. The place where Prototype 5 is parked at the reception. Williams has C-X75s because they’re the ones who designed and built the five existing prototypes for Jaguar. With 650 engineers, not one but two wind tunnels and all the tools needed at hand, it took them only 18 months to get from a clean sheet to the first running car. So, I popped the question to Craig Wilson, Managing Director of WAE: If Jag gave you the green light, how quickly could you produce 100-200 units in house? “I would say within two – three years to complete development and build the cars,” he told me. That’s all it would take. But here’s what I’m thinking. The thing about James Bond’s new Aston Martin DB10 is that it’s just not as cool as this now almost five-years-old Jaguar concept. Most people will see the C-X75 for the first time soon on the big screen, and there’s no doubt they will be blown away. Some of those people can afford to spend millions of dollars on a limited-run hypercar built by Williams. They will want to own one, so they will call Jaguar. Who have about three they could sell at the moment. James Bond is our best chance yet.